After many bug fixes and performances improvements we finally got around to a requested feature. Google Maps includes a heat map layer, so there is now an option to enable it. In addition, the opacity and radius of the heat map can be set. There is an option to view the heat map alone or the heat map with pins. Heat maps provide another way to view the density of pins. Red areas indicate a high density of pins the color fades to a light green as the density decreases. A good sample with heat maps enabled is the 14,000 zip code map. It shows a lot of zip codes on the east coast of the USA. There has been a lot of confusion with the premium big data plan, so this has been removed from new subscriptions. This is still available for those who are already subscribed to it. It supports up to 100K locations, but the latitude and longitude are required. There was a lot of confusion about this plan since people would subscribe to it hoping to map 30K+ addresses without the latitude and longitude. This takes too much time using the 50 address/second geo-coder. A request has been put in with Google to increase this speed. We are very sorry for the confusion this has created. The premium plan with up to 15K locations per map is available. The circle radius now appears in the generated image or pdf file when downloading the pdf or image of the map. Finally, the newest version of the google maps api is being used (3.30). Google updates this a few times per year. No major changes should be noticed, but a fix was made to allow embedded maps to work better on mobile and tablet devices. Legacy/free maps created before October, 2017 are deprecated, so changes Google makes to the api will flow through without 100% backward compatibility. These deprecated free maps will most likely be migrated to the new system on October 2018 (along with the limitations). Some changes were done to improve geo-coding speed. This should allow the rate for larger datasets (over 1,000 locations) to hit close to 50 addresses per second plus a few seconds for overhead. For datasets over 5,000 locations the rate has been measured over 49.7 addresses/second. Previously the rate could vary from 25-45 addresses per second. A single address generally takes less than 1 second (Google’s goal is less than 3 seconds), so these requests run in parallel. Another improvement is a cache can be used when creating a new map (with under 1500 locations) when all the addresses have successfully been geo-coded before. This will result in the map being generated really fast. 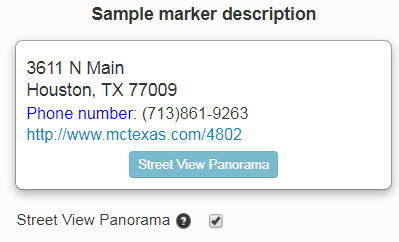 Another change was the dataset size to use the server side geo-coder has been reduced to 60 addresses. The server side geo-coder is queue based, so if someone has a dataset of 15,000 locations and someone comes behind them a minute later, the result could be a 4 minute wait. As a result, really small address sizes (under 60) will not use the fast geo-coder in order to avoid potentially waiting a few minutes when the slow geo-coder can process them faster. Finally, the last change was the ability to copy the description to the clipboard to paste it somewhere. This should work on iphones and ipads with IOs 10 or 11. It should not work on IOs 9 or below. It will most likely work on newer android devices as well. 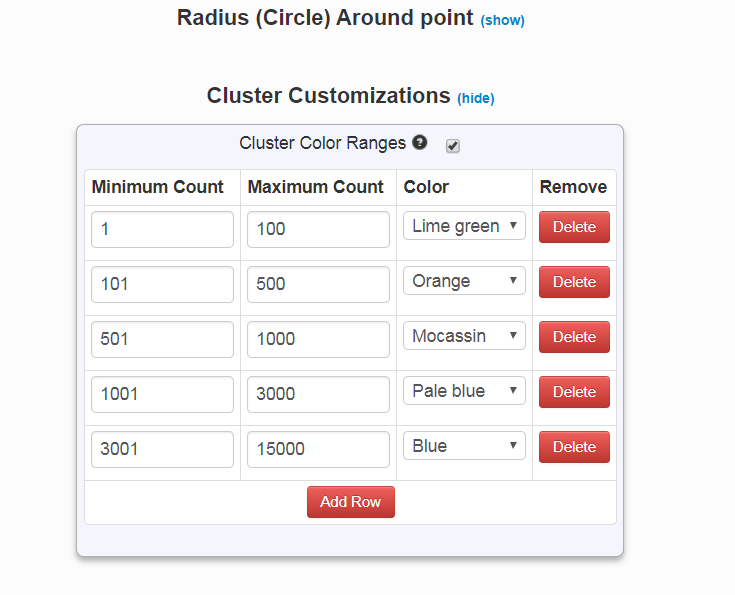 The ability to set the cluster color based on cluster size has been added. Any of the existing 20 different colors can be used. This feature is an advanced option. The premium map size has been increased from 10K to 15K entries when geo-coding is necessary. This means it could take upwards of 8 minutes to generate a large map based on a rate of 35-40/addresses per second. The quota was also increased. Quotas are mainly to prevent abuse, we can remove used items from the quota if needed. There was a lot of abuse in our old free system. A big bug was also fixed in the image/pdf generator where it would be not add pins in certain cases and the size was larger than it should have been. There are likely still some bugs with the pdf/image generator since it is fairly new and we haven’t tested all the kinds of maps that will be thrown at it. Definitely let us know if there are issues with it. We have dropped the enforcement of map passwords for users unless you are a premium/pro user. There has been too much confusion over this. In reality it should never have implemented. If you want map a password on your map then you will need to subscribe. The long awaited high resolution image generator has finally been released along with our subscription services. Plenty of people have been asking about paying for our service. High speed geo-coding, up to 50 addresses per second for datasets larger than 250 entries. We might be able to bump this up to 100. In reality it is more likely to be around 35-40 entries per second. Maps that would take 4 hours (9,000 entries) with the old bulk geo-coder can be done in 4-5 minutes. High speed geo-coding is queue based, so if someone were to attempt 100K items everyone would wait for them. For now there is a limit of 10K items that can be added to a premium map. This should prevent any major delays. Small datasets will also not be “forced” to wait behind any larger jobs. Automatic image exporting. This includes radius around a point, pin labels, custom images, and optionally a category legend. Currently this is limited in size to 10800×7200, but our image generator has produced images as large as 14400×10800. We hope to add custom poster size images in the future. A small addition is fixed pin numbers. When you have between 1 and 99 locations, you can have a numbered column and use that value. “Improved” marker images. We made an attempt to improve the pin images. All maps created before 9/30/2017 will continue to use the old code base and retain whatever features they had. A brief history of EasyMapMaker is we started out with a mission to bring affordable maps with rich features to those who did not want to pay high prices for few features. Our goal is to continue to add features as requested by users. Plenty of features have come from user requests, such as radius around a point, custom images, custom logo, and passwords. Most of these features have gone into our subscription bucket.